Elon Musk continues to confound all conventions as head of Tesla. Competitors are closing in with launch dates for their own new EVs to go up against Tesla’s, but true believers are unconcerned. Shareholders basically let him get away with talking about flying his other company to Mars while he keeps making excuses for missing production deadlines. And now at its plant in Fremont, Calif., Tesla reportedly is having huge problems in its new Model 3 with something as elemental to auto production as spot welding of steel. But not even any of that is the basis for the latest headline that indicates many things are not right with Tesla: Last week, the company reportedly fired several hundred employees— across the personnel matrix—for poor performance. Of course, such an action is routine in business, and Tesla does have about 33,000 other employees. Nevertheless, it does raise eyebrows occurring at a growth company that is run unconventionally—and is headed by someone who arguably breaks more performance promises than anyone else at Tesla possibly could. Chief Executive talked to a close Tesla watcher, Rebecca Lindland, an analyst for Cox Automotive and Kelley Blue Book—and someone who is among the 450,000 hand-raisers who have plunked down $1,000 deposits waiting for their own Model 3. Q: What do these firings reflect about Tesla? Do they say something about the culture? Or are they just trying to find scapegoats for their manufacturing problems? A: My understanding about the firings is that it was several different departments. I suspect the people who were let go were not measuring up to [Musk’s] very high standards and that this is an opportunity to get people in who will … He’s trying to do something very revolutionary. At the beginning when he’s hiring, I wonder if there was an element of, you kind of wanted people who believed in it, and now you need people who can actually do the work and push this forward, and not just the manufacturing side of it but marketing, accounting, the selling part of it, all of these different elements. This … happened after performance reviews—and they were very specific to say that. It could be a cover for sure, but I also wonder if it’s [the firing of] people who are doubting or questioning him or saying I don’t want to be part of this mission. Q: And what about the production problems, where there are reports Tesla last month was pulling Model 3s off the line and fixing them by hand. Sounds like the old days with rubber mallets in Big Three plants. A: My understanding is that because the Model 3 is made mostly of steel there have been issues with weld spots and joints. Models S and X are aluminum; steel isn’t what they do. That’s not what Tesla does. Tesla hasn’t done that before. It doesn’t matter that this is long-standing technology, if you’ve never done it before it’s an issue. And the tooling isn’t all done either. I wish that [Musk] would get in people not only that he would listen to but who would tell him, “No.” He doesn’t have enough people like that. I go back to the days when Bill Ford first took over Ford, and no one would ever tell Bill the truth because they didn’t want to let him know what was really going on. If Elon has cleared out some chaff, he needs to take the opportunity to hire some people that he will listen to and tell him the truth. Q: Model 3 problems: How significant are they? How much trouble is this model in? When do hand-raisers and deposit holders start to abandon ship? A: You’ve got 450,000 people waiting for them; I’m somewhere in there, at about 300,000. I’m glad I’m not earlier. I don’t want a prototype or to be a guinea pig. But this is a different price point, people like me who are not going to have multiple cars. And I’m really having second thoughts about whether I want one. He’s been able to attract people like him—innovators and early adopters—and now he’s starting to get into fast followers who are early mainstream. That’s what he needed to do to attract the kind of volume he needs. [But] people further down the innovation curve don’t have the patience for problem products. You have to move beyond the blindly loyal. So far, people have been buying into his dream and buying Tesla despite the fact that it’s electric. Now you have to get people who want the car and also are interested in the technology, and numbers have proven there just aren’t that many people like that. And competition is increasing. Q: To what extent is Tesla still the specter that’s driving mainstream automakers toward electrification and self-driving? Or are they over that, and it’s just market forces and inevitabilities in general that are causing so many of them to tip their strategies for the future into EVs and driverless cars? A: It’s regulations. Yes, they envy Tesla’s loyal customers. They certainly envy its capitalization. What other manufacturers are looking at is the loyalty they inspire in their customers, the patience and tolerance their customers show. The guy who was killed using Autopilot should have slowed [Tesla’s] momentum and it was just barely a blip. The one thing that Elon Musk has made clear is what he’s doing and why he’s doing it, as in Simon Sinek’s book Start with Why. Other manufacturers are a hundred years old and their “why are we doing this” is a hundred years old. What they’re envious of is Tesla’s ability to inspire absolute blind loyalty. Q:If you had to divide the Tesla brand-value pie into four how much would each of these pieces be? : Quality and innovativeness of the products; the fact that Tesla does everything differently; its future prospects; and just pure admiration of or fascination with Musk? A: It starts with Musk; 40 percent. Certainly the beauty of the products, the Model S— especially when you compare it with other electric vehicles—really pulled in people. The Model X is ugly. It’s easy to support him when he’s putting out beautiful products and Ludicrous mode and over-the-air updates. So product is 30 percent. The other 30 percent is the two other elements. He’s rebelling against the traditional franchises, and people like the selling process. He’s really tapped into the innovator mindset, just constantly challenging the status quo, and people want to be a part of that. That’s why we’re seeing 450,000 deposits for Model 3—because people want to share in that. For investors, it’s future prospects—and more Musk, because basically they’re betting on him. Q: What are the chances that Musk’s hubris will some day destroy the company? A: I think that we need people like Elon Musk in the industry. I love his visionary, anything-can-happen approach. 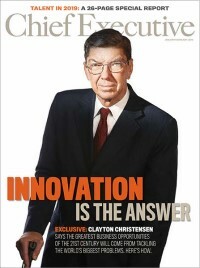 He truly is an innovator and there’s a very small portion of the public that has that kind of mindset. I want him to succeed. I wish I knew him better. [Hubris] may never [destroy Tesla]. If he brings in some strategic people that he actually listens to, then I think the company is in a much better state. Even [Morgan Stanley analyst] Adam Jonas has come back to reality a little bit. At some point, [Musk] has to start meeting targets. People have been giving him a pass because there’s nothing like the products he has on the market. Chevy Bolt is great technology but even when I was in it I thought that I want something that’s more luxurious and gives me the feeling of high-tech like the Tesla does.